If there is ever a moment to remind ourselves of the power of our intentions, it is now and with these cards. It is so often that we think we have no control of things we experience, the people we come into contact with, and the places we find ourselves. There can be a feeling of drifting along, waiting for some dear dream to manifest, or for some kind of manifestation that validates some purpose deep inside us. When I turned over the Ace of Cups first, I felt as I always do, this sense of relief, of acknowledgment, and of blessing. I then turned over the Queen of Cups and saw right away how this beautiful energy enters our life, how we participate with it and give it life in return. Notice how the Queen mimics holding the chalice in the same way as in the Ace. It is in her vision that she sees this. When I turned over The Tower, I simply said, “WOW!” The power of manifestation is so beautifully portrayed here, I can almost feel the electrical discharge tingling through everything around me. There is such a unique quality to The Tower card in the context of the other two cards here. We are experiencing a grounding force of energy unlike we have felt in a long time – or at least we are about to. On opposite sides of the Queen of Cups card, we see two depictions of descending energy. The Ace shows something subtle, soft, and radiant in its own right. It enters when a spiritual alignment occurs, and out of our intellectual control or reasoning. It happens when we don’t expect it to nor can we plan its arrival. It is a blessing that puts us into contact with humility and love. On the other side, The Tower shows a lightening bolt descending, but this time, it is not so subtle! What we see as flowing with grace and beauty in the Ace is exactly the same energy as is in The Tower, it is only its expression and quality that have changed. The energy in the Ace is one of non-form; The Tower is the echo in form, in manifested, tangible experience. If we were to overlay the Ace of Cups and The Tower, we would see how similar they are. The dove descending and the lightening bolt; the overflowing streams of water and the two figures being knocked out of their room plunging to the ground; and both cards have yods emanating from their respective scenes. Yods being symbols of grace and the presence of the divine in the changes that are occurring. What has created this intense scene in The Tower? What is the link between these two expressions of energy and power? The Queen. Yes, seemingly and unknowingly, she has come into contact with something extraordinary. She has created something very powerful in her hand with her skill and talent, and an almost tender patience. And since the source of her creative power is one of grace, the resultant and unleashed energy bolt sending shockwaves all around is most definitely something that will change things for the better. The Queen represents us. In this spread, she represents our ability to ground creative energy and to further shape the course of our lives. We can see the same grounding as depicted in The Magician. 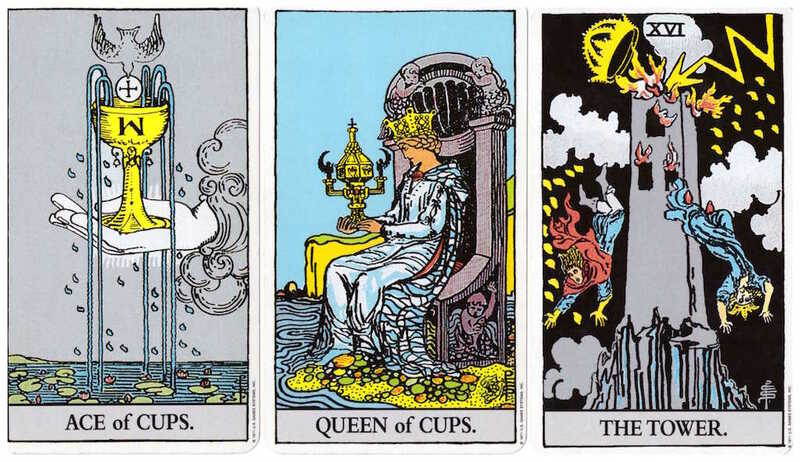 However, here we are using only the suit of Cups to draw from. This is a clue and insight into the type of energy we are working with. With the Ace of Cups setting the initial tone and quality of temperament, this reading tells us to have faith in the power of our creative visions for our future and to continue to nourish those intentions carefully so that we may guide them to their most beautiful end. With the Solar Eclipse occurring today, we are slowly emerging from a potent flushing of energy in and out of our lives. Like the Queen, gaze and breathe into your creations and visualizations, hold a still point of peace, and hold space for love to take you to where ever you want to go, and trust that you are going there. I’m always apprehensive when I see the Tower card but the way you connected them was amazing Dan; well, let us see how it will all manifest; thank you! Your knowledge of the cards matched with your intuitive interpretation makes your readings very accurate and enjoyable. I always feel inspired for what might come after I read them.